I need to move a HD between two PCs very often (once or twice a day) and I have been looking for a decent SATA Removable HDD rack, which is strong enough for it. I have been doing it with a cheapish IDE one which had a proprietary connector (actually a male/female centronics) between the removable tray and the fixed rack. The SATA ones I have seen, however, do not have any connector between the drive and the rack. They use the connector of the HD to plug into the female socket of the rack. For my needs, this is not a suitable solution. ISTR that SATA connectors have a life of 50 cycles. I don't mind replacing racks, but I cannot affort losing the data on the HD because its connector wore out. 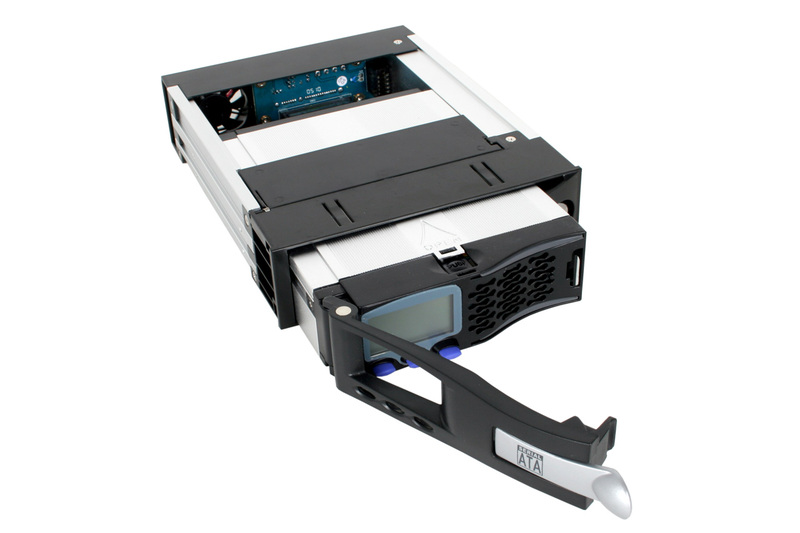 Have you seen any cheapish SATA aluminium removable racks with a separate connector between the fixed rack and the removeable tray so that, should that connector wear out, I can just buy a new rack? The IcyDocks that I use work as you want. If I look at http://www.icydock.com/product/image...2skgf-1_l2.jpg it seems to me that the connector of the rack is in the position where it would be if it would connect into the hard drive directly. Can indeed you confirm that there is a cable or some gizmo of some description between the SATA connectors of the hard drive inside the tray and the connector of the tray, so that it's the connector of the tray that wears out when plugged in and out of the backplane of the rack while the connector of the hard drive remains always connected into something. I have bought 2 of these SATA things, including an Icebox 128, and they all have a direct connection between the hard disk and the backplane of the rack. The hard drive slots into the caddy and pushes against the connectors there......the caddy then slots into the housing using a non-standard connector. So, if you had 2 of these installed in different PCs, you could swap the drives between them constantly and never effect the connectors on the drives themselves. Also, I have modded one of mine so that it accepts an IDE drive instead by taking the backplane out of the caddy and replacing it with one from one of their cheap IDE caddies.....the caddy to housing connector works for both SATA and IDE. Last edited by shaithis; 30-07-2007 at 04:34 PM. while the model with the "industrial" connector is MB122SKGF (clear as mud, if you ask me). I could not find that anywhere, but Scan has a MB123SK-B which also has a "industrial" connector and looks the same, but without the LCD. Sata HDD...am I going about this the right way?